Well-dressed and practical, the new Volvo V40 Diesel offers economical transport, reliable mechanics and a comfortable interior for five; be it in a smaller hatchback package. Lining up against the Hyundai i30, the Honda Civic Hatch, the Mazda 3 and Audi A3, the Volvo V40 is an attractive package, and in Diesel format is a tidy performer with good fuel economy. The aerodynamic shape of the Volvo V40 Diesel hatch kicks off at the low-slung nose where you find the start of a lengthy bonnet, enhanced by some sleek looking headlights that wrap around the front corners. Incorporated in the front air dam is an attractively styled air scoop that not only cools and feeds the engine with air but also holds the front end down on the road at high speed. Daytime running lights are set into the air dam at both of the outside corners. The line of the large sweeping windscreen catches the roof line and reaches to the V40’s backend, where it drops sharply over the car’s rear gate. As a distinctive rear design, the new Volvo V40 Diesel has one of the tidiest designs around. Finished with a roof spoiler and large L-shape taillights, the Volvo V40 Diesel hatchback is set to impress. One of the great things about any Volvo is that they not only look great but they are built to a high safety standard. They are equipped with the best safety features and always feel exceptionally solid – whether it is out on the open road or when you just close the door, they always have a satisfying solidity. Both Volvo V40 Diesel variants are FWD and they handle with an accurate steer. The base model holds the D2 engine with 89 kW, and 280 Nm between 1500 and 2250 rpm. The D4 model has a big step up in power and boasts 140 kW, and 400 Nm between 1750 and 2500 rpm. For reliable, responsive engine power with a great gas mileage, the D2 V40 Diesel is very satisfying to drive. The quiet (for a diesel) engine purrs along nicely and sits easily at high speed. The D2 engine can be mated to a manual or manual/automatic gearbox, depending on your preference. For some exceptional performance, the Volvo V40 D4 Diesel packs a powerful punch and can run some quick sprint times from 0-100 km/h. You can accelerate from a standstill to 100 km/h in under eight seconds. The common rail turbo-diesel engine never really feels short of a gallop, and can happily travel at high speed all day long. 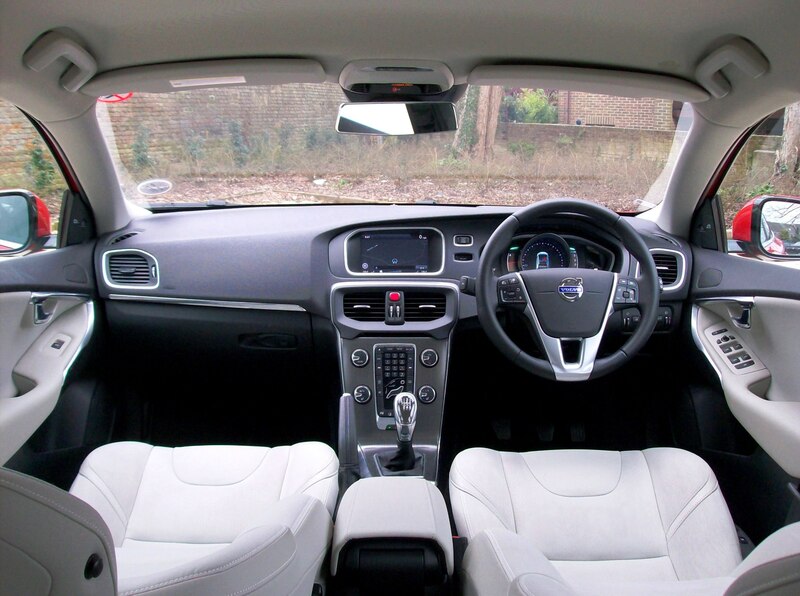 With the Volvo V40’s renowned comfort levels, you can eat up the miles in style. The six-speed manual/auto gearbox is slick and easy to use. One of the beauties about this engine is that you can use close to 4 litres/100 km on a gentle cruise. Two levels of comfort are available, and then you can add extra features as required. The Volvo V40 Diesel Luxury variant has a high level of Swedish comfort and features Sensus navigation with voice control, leather upholstery, an electrically-adjustable front passenger seat, and active bending lights for easier and safer night driving. The Volvo V40 Diesel Kinetic has some standard features that include: the City Safety package, a rear parking camera, an electrically-adjustable front driver’s seat, a Sensus Connect high performance audio infotainment system and Bluetooth phone connectivity. Volvo continues to shine in its popularity for building well priced, stylish cars that are rewarding to drive. For any more information on the Volvo V40 Diesel or, for that matter, any other new car, contact one of our friendly consultants on 1300 303 181. If you’d like some fleet discount pricing (yes even for private buyers! ), we can submit vehicle quote requests out to our national network of Volvo dealers and come back with pricing within 24 hours. Private Fleet – car buying made easy!